Zap Professional Restorer Review: Does it Work? We found Zap to work moderately well as a standard cleaner. Advertising that claims it can penetrate and restore surfaces to a new condition seem somewhat exaggerated based on our tests. Zap is a professional strength restoring solution which restores tile, porcelain, and other surfaces to look brand new. You can get Zap! from the official product website for $19.99 + $6.95 P&H. You can’t opt out of the double offer, meaning you must pay another $6.95 for a second set. This brings your total to $33.89 for two set, of which $13.90 is non-refundable shipping. Each set contains Zap Restorer, Zap Maintainer, and every double offer gets two Zap pads, and a foaming sprayer. There is a 30-day money back guarantee, minus shipping. Standard delivery time is said to be 7-10 business days. You can find Zap in stores for about $10 for a 10 ounce bottle. Below is a 2016 television commercial for Zap. Can’t get those disgusting stains out of your kitchen counter? Don’t replace it, Zap it! Is that tile hallway so dingy and dirty, you’re ready to rip it out? Don’t replace it, Zap it! Has your bathroom become so embarrassing, you’re ready for a remodel? Don’t replace it, Zap it! Introducing Zap, the professional strength restorer that’s guaranteed to make porcelain, fiberglass, tile and grout, and real metals like brass, copper, and cast iron all look brand new again or you money back. Zap is as easy as 1-2-3. Just spray it on, let it sit, and wipe it off. And in just minutes, your surfaces are back like new. Zap is a restorer, not a cleaner. Ordinary cleaners only work on surface dirt, but Zap actually penetrates stains to restore surfaces to their original new shine. Watch as we use Zap on this old brass fixture. In just seconds it’s restored like new. Zap, with its fresh wintergreen scent, works on toilet bowls, rust, and hard water stains. In fact Zap is so effective it’s guaranteed to remove any stain from any of these surfaces or your money back. “The bathroom was in such bad shape, we didn’t know what to do, and then I discovered Zap. I sprayed it on, wiped it off, and there it was, completely restored. Replacing these surfaces could cost hundreds, even thousands of dollars. But why replace it when you can restore it with Zap concentrated restorer for only $19.95. We’ll also include a free Zap sprayer attachment, a free bottle of Zap Maintainer, plus two industrial Zap pads. Call in the next five minutes and well double your order of Zap free, just pay separate processing and handling. 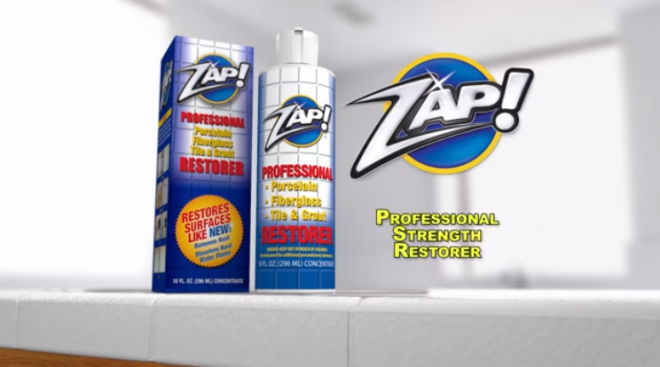 Although Zap Restorer (often stylized as “Zap!” with an exclamation mark, which we won’t do here) has been around for a number of years, the product re-emerged in 2016 with a new marketing campaign and website. The commercial above shows dramatic before and after photos of tubs, sinks, and even pots and pans. These results are said to be achieved by simply spraying it on and wiping it off, restoring surfaces to a new shine. It is said to remove stains and rust with minimal effort. Where Zap can and can’t be used. According to the bottle, Zap can be used on porcelain, ceramic tiles, shower doors, sinks, bath tubs, white grout and caulk, toilet bowls, fiberglass, and acrylics. It cannot be used on natural stone, marble, wood, fabrics, painted surfaces, and wall coverings. You are also instructed not to use it with other cleaners or bleach. What’s the difference between the Zap Restorer and the Zap Maintainer? The restorer is supposed to be sprayed and left on for a few minutes, then scrubbed off, while the maintainer is supposed to be sprayed on and wiped off after 10 minutes. It would appear that the Restorer is a higher concentration than the Maintainer. The crux of the Zap advertising is that it penetrates surfaces, and restores them to their original shine. Our tests of Zap did not corroborate such claims. While we found Zap to work moderately well as a standard cleaner, we didn’t see dramatic results depicted in the advertising. Additionally, grout in a bath tub is often stained by mold, which is almost impossible to remove. For that purpose, we did not find Zap to restore grout to a “new” condition. The soap scum on top of the grout was easily removed, but the discoloration remained. As of this writing, Zap has an unimpressive 2.0 star rating on Amazon, with 58% of the ratings being only 1 star. Pro tip: Test Zap on a small area before going great guns – just to make sure your surface can handle the cleaner, and does not discolor. Bathroom and floor cleaners are ubiquitous. There is no shortage of products which make similar claims, and have rather high consumer ratings. You may want to consider Tilex, Iron Out, or even an inexpensive tried-and-true product like Comet or even bleach on difficult stains (depending on your surface). If you are set on a cleaner using phosphoric acid, you may want to peruse the numerous options in this category to see what else is available. If you’ve used Zap, please give it a star rating and comment below. Lazer Bond USA Review: Does it Hold Up? Flex Seal Liquid Review: Does it Stop Leaks? 5 Second Fix Review: Glue Alternative? RIP OFF ZAP! BS HYPE Con artist purchase website!!!! CON ARTIST COMPANY like many OTHERS!!!! Product arrived in Plastic Bottles that had been pierced on top edge (during packaging?). Result was liquid mess inside zip lock bag holding bottles. Adding Insult to Injury, they included a “Handy Sprayer” that was completely Useless!! Their Company Motto is Obviously “We’re Not Happy Until YOU’RE Not Happy!” Don’t Buy This Rip-Off! have tried to reach this company by phone, have given e-mail and on line, no response. I ordered Zap cleaner in July have not received product. Will want my refund and will contact our local BBB. Bought Zap in drug store was the worst investment I ever made. Tried it on my bathroom tiles. All it did was drip off and did nothing for the stains. All i got was a horrible smell with no results. Don’t know what tile they used on commercial but didn’t work on mine. Sounds like false advertising to me. I urge you not to buy it or you will end up returning it and losing some of your money. Since refund is minus shipping and handling. Don’t waste your money. Bought Zap for the tiles in my bathroom and did absolutely nothing. Mold and mildew was still there. All I got was a bad smell in my bathroom. The liquid just dripped down my tiles an did nothing. Don’t know what tiles they used in commercial but didn’t work on mine. ineffective as a SUPER cleaner. Tilex and Clorox worked better, easier and cheaper.